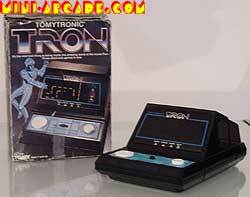 Comments: My favorite game in this series of Tomy games. 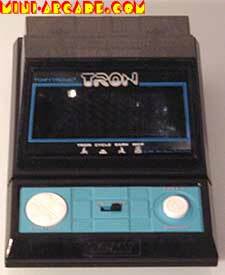 The only tron handheld game that I know of. 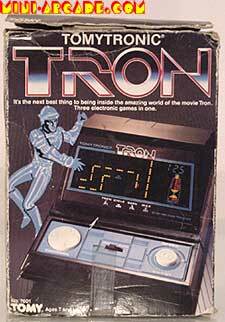 When I was 12 or 13, I saw this game on sale at a Kaybee Toys for around $15, and I really wanted to buy it. I even had enough of my own allowance money to afford it, but my mother wouldn't let me - she said it was a wasteful way to spend money, and so I replied "So what?!!?" 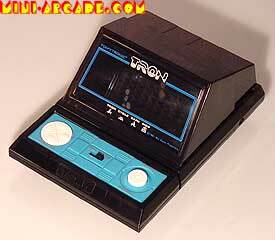 - needless to say, I did not go home with tron that day, and it took me nearly 12 years to finally get hold of one. the speed/throw button is shaped and looks like a disk! 3 stages of play: light cycle, 1-on-1 disks, and then you try and throw your disk into the MCP!